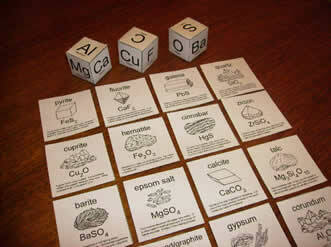 To learn the chemical formulas for some common minerals. A card/dice game. Players roll three dice marked with element symbols. If they roll the elements required to make one of the minerals, they pick up the card. First player to pick up five cards wins. One game can take anywhere from 5-20 minutes. It’s a short game that you play more than once.